Despite all evidence to the contrary, the media insistently portray Trump as a normal candidate. Harry Enten of Nate Silver’s FiveThirtyEight.com titled a recent post “The More ‘Normal’ Trump Can Make This Race, the Better His Chances.” This is obviously true, and hence every effort by the media to treat Donald Trump as a “normal” presidential candidate brings us closer to the potential destruction of our democracy. And yet we can see it taking place at virtually every level of our media. The media deserve a good deal of blame here, not only because of the billions of dollars’ worth of free airtime television networks have given to Trump but also because of their insistence—against all evidence—that he is someone other than the person he clearly presents himself to be. On September 7, NBC perfectly demonstrated how entrenched the forced normalization of Trump has become. 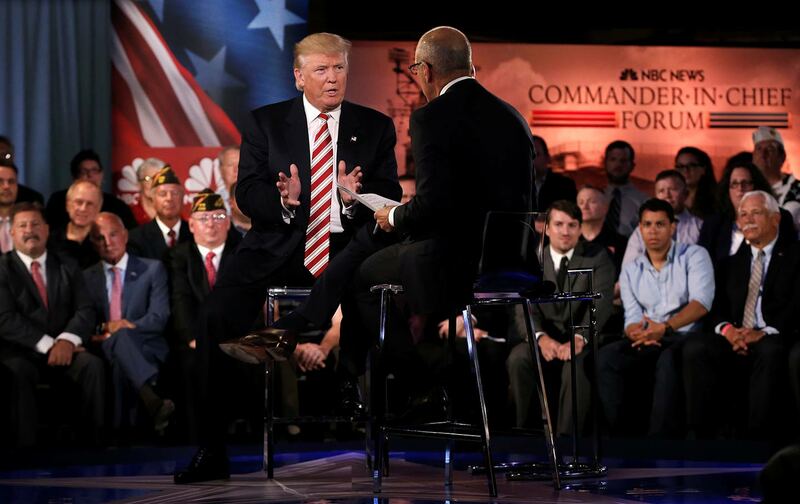 Matt Lauer’s disgraceful performance during the “Commander-in-Chief Forum,” held aboard the battleship Intrepid, proved so egregious that it may have shamed others into taking the Trump threat more seriously. Given a chance to sound presidential and equal in stature to the former secretary of state, Trump made one offensive, idiotic, and demonstrably false assertion after another. Lauer challenged none of them. At the same time, he treated Hillary Clinton’s e-mail choices in office as the most significant national-security issue of the campaign, devoting a third of his questions to her to the topic. (Had the forum taken place four days later, the global threat would have been pneumonia.) Not only were the veterans in attendance reduced to pointless props; so, too, were the issues themselves, since Lauer apparently did not know (or care) enough about them to ask a single intelligent, informed question of either candidate. Fox has strong reasons to pull for Trump beyond merely ideology and access. By hiring two members of the lunatic white-nationalist fringe to run his campaign—Steve Bannon of Breitbart News and David Bossie of Citizens United and other infamies—Trump may be laying the foundation of a media empire that could challenge Rupert Murdoch from the right, and thereby cost Fox much of its audience. The post-Ailes takeover of Fox by Murdoch’s sons James and Lachlan could make the opportunity irresistible—to say nothing of Ailes’s apparent role as a close Trump adviser. The net result, though far less worrisome than a Trump presidency, would be the further normalization of the hateful nonsense spouted on Fox and by the Trump campaign in the postelection media landscape. “Every day that goes by, this just becomes more and more of a reality-television show,” Hillary Clinton has observed. “It’s not a serious presidential campaign.” Indeed, not even the reported non-disparagement, non-disclosure agreement between Trump and his former campaign manager Corey Lewandowski (nowhere denied though also not proven), nor Lewandowski’s violent manhandling of female reporters on camera, prevented CNN from offering him a lucrative contract as a “political commentator.” Has there ever been a more insulting hire to a group of journalists than this man? Has there ever been a more obvious abdication of the profession’s responsibility to provide audiences with the truth, regardless of whose interests it might serve or injure? The high-brow Atlantic magazine has also proven itself particularly susceptible to the disease of Trump normalization. Most recently, in a September 2 piece on Trump’s exploitation of voters’ fear, Molly Ball insisted that “critics who accuse Trump of cheap fear-mongering may be failing to recognize that the fear percolating in society is real, and somewhat justified.” Note the use of the weasel-word “somewhat” in that sentence. “Trump paints a fearful picture, and events validate his vision,” she continued—though just what form of “validation” Ball has in mind is not entirely clear. Immigration from Mexico has actually declined in recent years. (India and China each send more immigrants to the United States than Mexico does.) Violent crime rates are flat or falling in almost all major cities. As a nation, we are experiencing, on average, 8,000 fewer murders annually than we did 20 years ago. And do recent terrorist attacks in Paris and California, both of which Ball cites as “validation,” somehow justify Trump’s claim that “Obama was the founder of ISIS”? Finally, in one of the silliest examples of false equivalence I’ve seen during the entire campaign, Ball equates Trump’s dangerous nonsense with Clinton’s accurate evocation of the potential dangers of a Trump presidency. Clinton, Ball writes, “is now campaigning on a fear-based appeal of her own—the fear of Trump.” Apparently, the only thing we have to fear from a Trump presidency is fear itself.